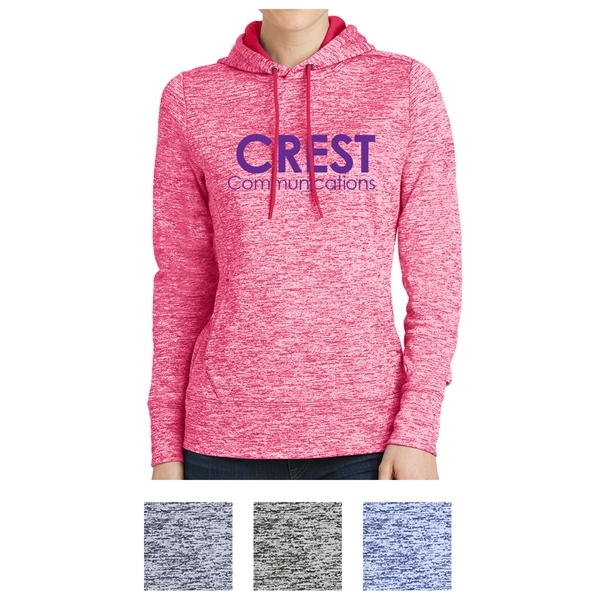 Imprint Location: 2XL Silk-Screen Location 1 - Get people excited for your brand when you offer this Sport-Tek Ladies PosiCharge electric heather fleece hooded pullover! It's made of 100% polyester and features a taped neck, three-panel hood with solid lining and dyed-to-match drawcords, set-in sleeves, princess seams with integrated front pouch pocket, and elongated self-fabric cuffs and hem. It's made with a gently contoured silhouette and features moisture-wicking as well. Add an imprint after choosing from our collection of assorted colors, and make this your own! Imprint Size:12" x 12", 4" x 4", 2" x 12"